¶ 1 Leave a comment on paragraph 1 0 In the Fall of 1951, Msgr. John O’Grady became NCFR’s ninth president and served 15 months, through Summer 1953. 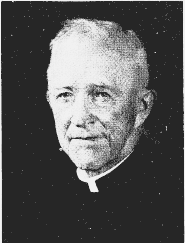 He had authored a book, Catholic Charities in the USA, and was a scholar and historian. He served for 32 years as Director of National Conference of Catholic Charities. He was also a sociology professor at the Catholic University of America and Trinity College in Washington, DC. He was a pioneer in the development of public housing policy in the United States and was also known for his work on aging. He was appointed to the President’s Commission on Immigration and Naturalization. ¶ 3 Leave a comment on paragraph 3 0 For those who are engaged in social work the present is very real. Scores of problems crowd into every day, demanding an immediate solution. So much attention is consumed by present situation that we have little time for the past. We are inclined to lose sight of the forces and circumstances that gave birth to our institutions and organizations. . . . We cannot understand the ideals, traditions, and attitudes that find expression. . .without some appreciation of their genesis. Every one of them carries with it the impress of many conflicts, many personalities, many successes and failures. These have become a part of its very life. Unconsciously, they color its outlook and “influence” its attitudes.